We know it’s April Fool’s Day, but we wouldn’t play you about this: Speck is coming out with something crazy cool for your new Apple Watch, and soon. 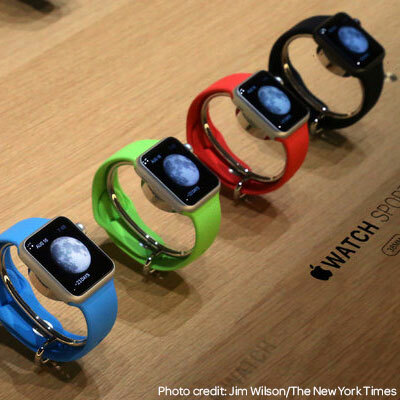 By know we’re counting down to April 10, the official preorder date for Apple Watches. You’ll also be able to go by an Apple store to see the new devices in-store on display and available for try-ons. We can already imagine the line winding out the Apple store doors. Of course, if you’re order this Apple smart watch, you’re thinking about the different ways you’ll use it. Look no further than Yahoo’s list of top 25 Apple Watch apps to sync with your iPhone 6 or iPhone 6 Plus. Topping the list are some fan favorites already: Expedia, MLB.com, and… The New York Times? That’s right, The New York Times announced yesterday its app for Apple Watch, “which will consist of a sentence accompanied by bullet-point summaries and photography or graphics.” Even though we haven’t seen it yet, it already sounds like the next generation of snackable, shareable content. What are you most excited to see on the new Apple Watch? Share with us below, and be sure to sign up for notifications and news about what we’ve got coming for your new favorite Apple device.